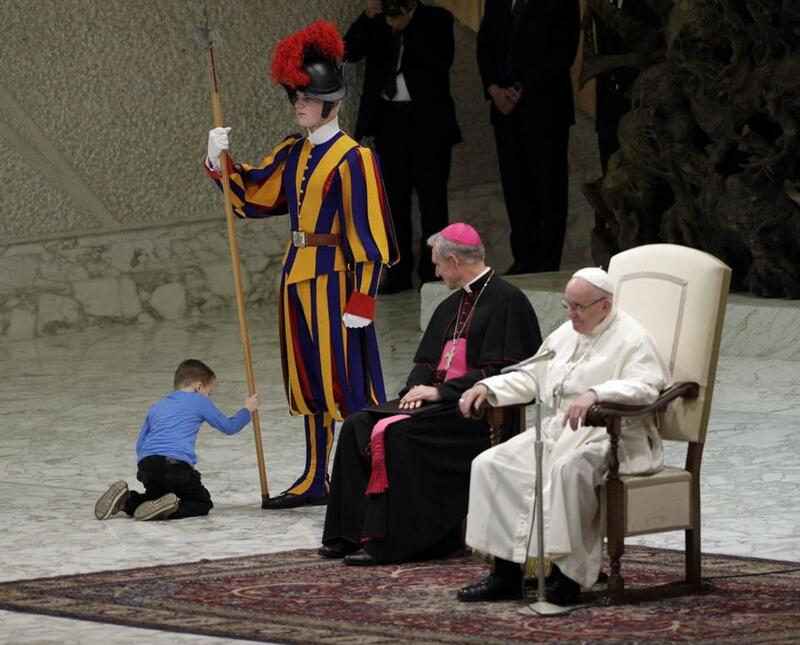 A child played with a Swiss guard in the Paul VI Hall at the Vatican Wednesday during Pope Francis’s general audience. VATICAN CITY (AP) — Pope Francis praised the freedom — albeit ‘‘undisciplined’’ — of a child with disabilities who climbed onto the stage Wednesday to play during the pontiff’s general audience. At one point, the boy’s Argentine-Italian mother came on stage to fetch him and explained to Francis that he couldn’t speak. Francis told her ‘‘Let him be, let him be’’ and the mother retreated and let Wenzel continue to play. When Francis took the microphone, he explained in Spanish to the crowd that the child was speech-impaired. ‘‘But he knows how to communicate, to express himself,’’ he said. ‘‘We try to let him be free. He has to express himself, and we live without hiding his problems,’’ he said. ‘‘It was not planned,’’ he said, though he added that the family had told Wenzel that they were going to see the pope and that he was clearly excited at the prospect.